I have not always been a fan of the Beach Boys. I remember going music shopping with my brother years ago, and having little spending money in our pockets (we were 10 & 11 at the time), we decided to dig through the bargain bins. My brother chose the Beach Boys' Pet Sounds, and I chose Neil Young's soundtrack album, Journey Through the Past. Even at that young age, I sensed we were moving in two different musical directions. As I got older, I began to realize that songwriting talent (and musical ability) is not limited by genre, and though I am still a bigger fan of Neil Young than the Beach Boys, I can appreciate the talent that Brian Wilson and crew poured into this album. My friend Wendy Williams at Toolshed Media calls Pet Sounds the "Rosetta Stone of modern pop," and after listening to this remastered edition, I have to agree. To enter the contest, list one reason why the Beach Boys are better than Neil Young. The deadline for entries is Monday, August 28th, at 11:59 p.m (central). Please leave your entry in the comments, a winner and runner-up will be chosen on Tuesday, the day the 40th anniversary edition of Pet Sounds is released. 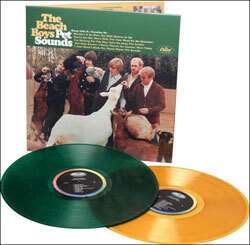 The winner will receive a copy of the vinyl two-disc 40th anniversary edition of Pet Sounds on glorious colored vinyl (yellow for the original mono mix, green for the remastered stereo version). The second-place prize is a limited edition CD/DVD version of the disc. Additional prizes may be issued at my discretion, but be forewarned, these may include a copy of the Cheyenne Kimball disc that was sent my way. Entries are now officially closed, a winner will be announced Wednesday morning, August 30th.